The 4I20 is a stackable PC/104 card with 24 open drain 350 mA outputs for solenoids, valves, relays, motors, incandescent lamps and other medium power DC loads. The 4I20 outputs are galvanically isolated from logic ground to avoid ground loops, as the total ground return current be as much as 8.4 amps. The isolation also allows the 4I20 to drive ground referred loads. The 4I20 has readback capability on all outputs to verify output switching, and allow unused outputs to be used as input bits. The output drivers on the 4I20 (TI TIPC6A259) have a built-in 800 mA current limit and are protected against short circuits and capacitive loads with a unique chopping current limit system. The outputs have built in 50V clamp diodes to allow driving inductive loads without external flyback diodes. The 4I20 output connector is a 50 pin header with I/O module compatible pinout (interleaved grounds), allowing the 4I20 to drive unbuffered OPTO-22 style I/O module racks. All outputs have optional (plug in) pullup resistors that can be powered from the isolated 5V power on the 4I20 or external power. 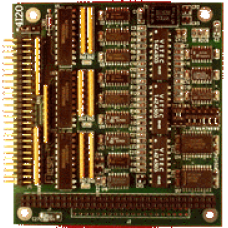 The 4I20 input and output are organized as a 24 bit multiplexer and a 24 bit addressable latch. This allows simple addressing of single I/O bits. 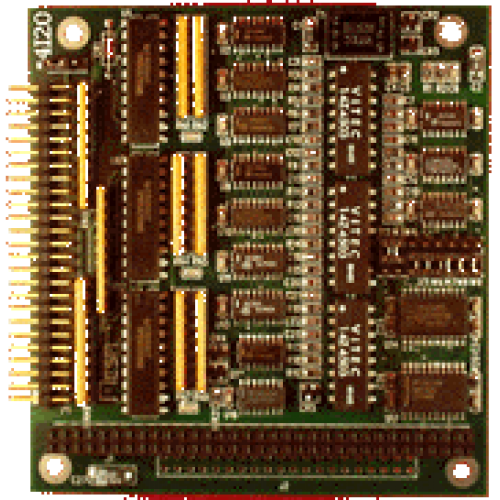 All 4I20 access is through a single 8 bit I/O port.